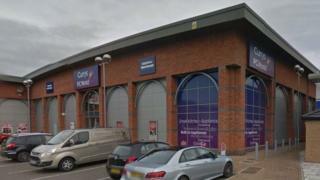 A man has been charged after several shoppers were sprayed with an "unknown substance" at Currys PC World. A number of people reported "irritation to the face" after the incident in Northfield Avenue, Kettering, at about 15:45 GMT on Friday, police said. Paramedics treated those affected at the scene. The substance has since been found to be non-hazardous. A 29-year-old man was charged with possession of an offensive weapon in a public place and assault. He was due to appear before Northampton Magistrates' Court.